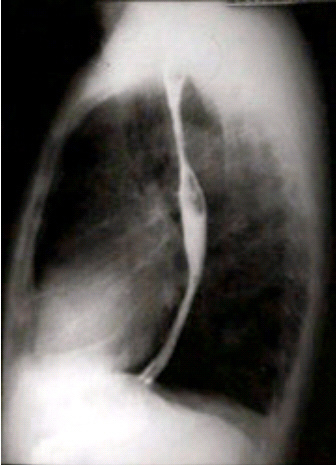 The esophagus may be examined by performing a single-contrast study in which only barium or another radiopaque contrast agent is used to fill the esophageal lumen. A double-contrast procedure also may be used. For this study, barium and carbon dioxide crystals (which liberate carbon dioxide) are the two contrast agents. No preliminary preparation of the patient is necessary. If an esophageal perforation is suspected, water-soluble contrast is used by convention. Left anterior oblique projection, single-contrast esophagram. Image courtesy of Dr. Naveed Ahmad. Single-contrast study of esophagus in RAO position with table top in head-down -20° position. Image courtesy of Dr. Naveed Ahmad. Place the patient in the right anterior oblique (RAO) position to offset the esophagus from the spine. The patient’s right arm is placed alongside the body, with the left knee flexed. The technologist should place the cup of barium in the patient’s left hand, with the straw between the patient’s teeth. The patient’s neck is turned to the left, and the head is placed flat on a pillow. Patients who are unable to tolerate this position may be imaged in the left posterior oblique (LPO) position. Position the fluoroscope so that the apex of the left lung appears at the top of the monitor. The technologist will ask the patient to continuously drink the barium. This fills and distends the esophagus while the technologist obtains images of the proximal esophagus, midesophagus, and the distal esophagus, including an open lower esophageal sphincter (magnified if possible). PA oblique esophagus, RAO position (the midsagittal position forms an angle of 35° -45° from the grid device). Image courtesy of Dr. Naveed Ahmad. The performance of the double-contrast esophageal examination is similar to that of a single-contrast examination. For a double-contrast examination, free-flowing, high-density barium must be used. A gas-producing substance, usually carbon dioxide crystals, can be added to the barium mixture or taken by mouth immediately before the barium suspension is ingested. Spot radiographs are taken during the examination, and delayed images may be obtained on request. 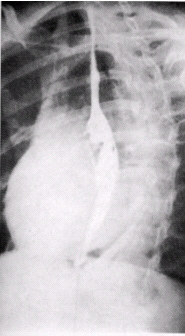 PA oblique distal esophagus, RAO position, double-contrast spot image. Image courtesy of Dr. Naveed Ahmad. Double-contrast study of esophagus with patient in LPO position with table top in vertical position. Image courtesy of Dr. Naveed Ahmad. Have the patient stand on a footboard in the LPO position to offset the esophagus from the spine. Place the cup of dense barium in the patient’s left hand. Have the patient take a small sip of the dense barium to become acclimated to its consistency. 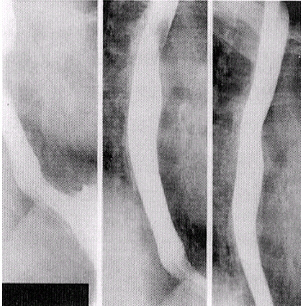 If the patient appears unable to tolerate the dense barium, obtain a single-contrast esophagram. Instruct the patient on the swallowing sequence. This is essential for obtaining a satisfactory exam. The patient's head is tilted back to extend the neck. The patient drinks the barium with moderate rapidity and with constant encouragement by the technologist. Caution the patient not to burp. Image the entire esophagus as the patient is drinking, observe the esophagus for a "silver-satin" appearance -- indicating the best possible coating -- and obtain images of the proximal esophagus, midesophagus, and the distal esophagus. The three basic post-fluoroscopy projections for the esophagram are the anteroposterior (AP) or posteroanterior (PA) projection; AP or PA oblique in the RPO or LPO position; and the lateral projection from the right or left position. Position the patient as for chest radiographs (AP, PA, oblique, and lateral). 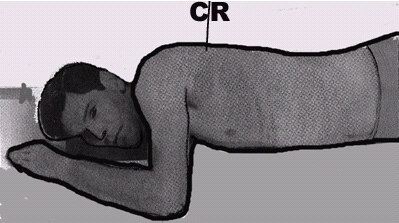 The right anterior oblique (RAO) position is usually used in preference to the left anterior oblique (LAO) position. An RAO position of 35° -40° gives a wider space for an image of the esophagus between the vertebrae and the heart. The LPO position may also be recommended. The patient is placed in the recumbent position for esophageal studies unless specified otherwise. This helps to obtain a more complete contrast filling of the esophagus (especially filling of the proximal part) by having the barium column flow against gravity. Moreover, the recumbent position is also used to demonstrate variceal distensions of the esophageal veins. Lateral esophagus, single-contrast study. Image courtesy of Dr. Naveed Ahmad. 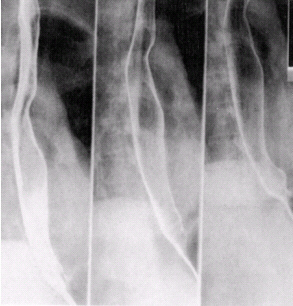 Thin barium: For complete filling of the esophagus with thin barium, the patient may need to drink through a straw to achieve continuous swallowing. The exposure is made after three or four swallows without suspending respiration, and using as short an exposure time as possible. For the demonstration of esophageal varices, instruct the patient to fully expirate and then to swallow the barium bolus -- avoid inspiration until the exposure has been made. A PA esophagus single-contrast study showing a good esophagram. Image courtesy of Dr. Naveed Ahmad. 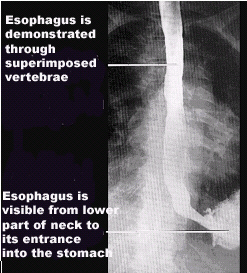 The esophagus should be clearly demonstrated from the lower part of the neck to its entrance into the stomach. Technical factors should be adequate for penetration of the barium. On an AP or PA projection, the esophagus should be clearly demonstrated through the superimposed thoracic vertebrae. No rotation of the patient should be seen on an AP or PA projection. On a lateral projection the esophagus is demonstrated between the vertebrae. The heart and ribs posterior to the vertebrae are superimposed to show that the patient was not rotated. On an oblique projection the esophagus is demonstrated between the vertebrae and the heart. The patient’s arm should not interfere with visualization of the proximal esophagus.